‘MTV Spring Break Oasis Cancun is returning to the Oasis Cancun for Spring Break ‘2019. MTV first descended on Spring Break in 1986 from Daytona Beach. With them they brought insane concerts, outrageous parties, and scandalous contests. MTV set the Spring Break expectations high for college students across the country. Year after year they showed us beautiful people having the time of their lives in beautiful locations that had us itching to get to college and experience it for ourselves. While the broadcasts may have come to an end, MTV has continued to host wild Spring Break weeks in top destinations like Las Vegas, Jamaica, and Panama City Beach. This year, MTV Spring Break is making their way back to Cancun, Mexico March 16th-22nd, 2019 and will being hosting can’t miss events at the Oasis Cancun ALL WEEK LONG! This is a week you’re gonna wanna be at. The 80’s. Most enjoyed a simple lifestyle of little technology, crazy hairstyles, rock ‘n’ roll, and little rules. MTV debuted on TV screens during 1981 and by 1986 they were defying normal TV programs as thousands tuned in to live streams of wild college kids partying in Daytona Beach. Between 1986 and 1989, MTV Spring Break brought live performances by top bands like The Beastie Boys, beach parties, competitions like The Dating Game, and of course unpredictable drunk college kids to Daytona Beach and TV screens across america. People that were actually on Spring Break and experiencing if for themselves described it “chaotic” and “the most fun they’ve ever had” (from what they remember). The 90’s were a confusing time of baggy clothes and tiny sunbathing and when MTV Spring Break had really erupted. The widespread success of their parties and broadcasts allowed them to step up their game. They hosted events in multiple locations and brought in more recognizable names like The Spice Girls, Eminem, No Doubt, and Britney Spears to name a few. Expanding into foreign countries brought under 21 year old’s into the equation for some of the biggest crowds ever. MTV had Spring Breakers entertained all day by bringing popular pop culture icons on location to host NSFW activities like bikini contests hosted by RuPaul and live Jerry Springer shows. Spring Breakers to see just how far would go for some cold hard cash. While MTV Spring break broadcast has fallen out of popularity and moved to MTVU, a partner channel, the parties are still can’t miss events every year. STS Travel is prepared to be right in the middle of the action. If you want to fulfill your preteen dreams for Spring Break, now is the time to make plans before prices spike. For a limited time, The Oasis is offering their lowest prices that you are going to want to take advantage of! The Oasis Cancun Lite is the King of Spring Break resorts, featuring over 1,500 rooms, the largest pool in Cancun, and a full schedule of daily entertainment. 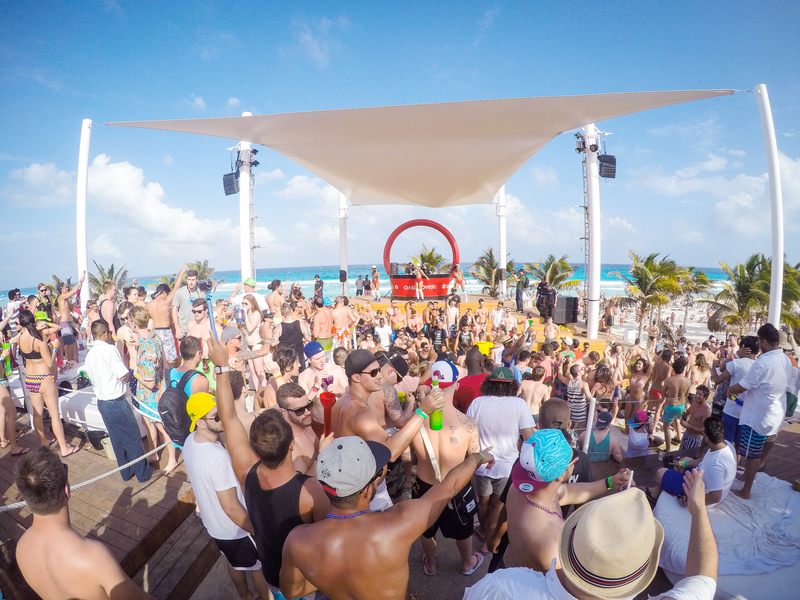 This legendary party resort has brings Spring Breakers from around the world together for an epic celebration.The resort is located in the safest area of Cancun with thousands of Spring Breakers coming back each year! When you travel to Oasis with STS we have you covered. You not only get an all inclusive stay, but you get your flight to Cancun and your airport transfers taken care of! At the resort choose from 10 restaurants and 8 bars. Your options are limitless! Unlimited food and drink 24 hours a day. .Guests can also enjoy epic beach parties, with big name guest Djs each week.